In one of his novels Peter Handke describes the dilemma of a goalkeeper who faces a penalty: Should he jump? To the left or the right, high or low, far or short? Handke’s goalie stands still and thus saves the penalty. Editors of coffee-table books face a very similar problem. They want to present a certain subject in images, and because there is a limited amount of space even in a large book they have to make a choice. Do we show Roman architecture in a long shot or point out the details? The selection of photos is by definition arbitrary and depends on the taste of the authors. They have to trust in their own taste and hope their choice is right. Like Handke’s goalie they only have a small chance to call the ball, i.e. to hit the taste of the public. Most coffee-table books benefit if the authors go and stand by their personal choice. It may not be to everyone’s liking, but it certainly is honest and authentic. 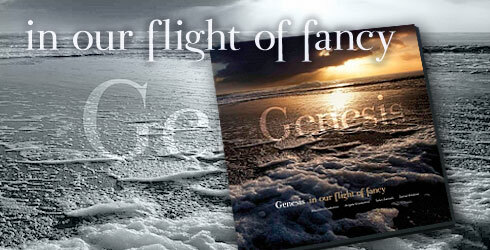 A new publication called Genesis In Our Flight Of Fancy lies before me on the table. The poetic blurb on the back describes it „a tribute not only to the music and lyrics of Genesis but also to their significance to the authors' lives.“ That may prove a problem, for how could one truly understand what the other feels in a piece of music? We will see. The cover image promises high-quality photographies. The large format of the book (30x30cm) help make the images look good on the heave matte paper. Having turned to the first combination of images and text the reviewer is pleasantly surprised. The photos are real eye-catchers, but they are not the dominant element on this double page. There is in fact not central element to which everything else is subordinated; image and text areas are in a very delicate balance; giving more weight to the one would not only harm the other but the overall effect. Each double page has its own layout, the “standard layout” (i.e. a central image with the text in small black print in the corner) is happily and carefully avoided. Though the lyrics use the same font throughout the book, it varies in size, colour and shape. Sometimes the letters follow an arc that has begun in the image, sometimes they are distributed across the page as if a speaker wanted to give a visual impression of their intonation; single words or lines are frequently printed in a different colour, thus providing a new sense in the lyrics. Daniel Klöckner, the visual designer, has done a truly excellent job here. The surprise is pleasant for another reason, too: The first combination of image and text is already so strong that it forces the reader to abandon their own ideas for a while and get into the relations between these images and these lines. The photos never fulfill conventional expectations; the first double page quote a few lines from Squonk, but the photo does not show a cute (or even ugly) furball but a much rougher reality. The links between the lyrics and the images are clear, though never obvious to the point of triviality. They urge the reader not only to see but actively to discover the connections: Images and words turn into food for thought. Even if you exclude the bizarre stories from the Gabriel era the lyrics of Genesis are frequently described as somewhat removed from reality. Apart from love’s labours won and lost the lyrics often deal with histories that are fictitious or long part (Eleventh Earl Of Mar), peculiar animal stories (Squonk, All In A Mouse’s Night) or strange encounters of the third kind (Keep It Dark). The photos in this book haul the lyrics back from fiction to reality (or vice versa). 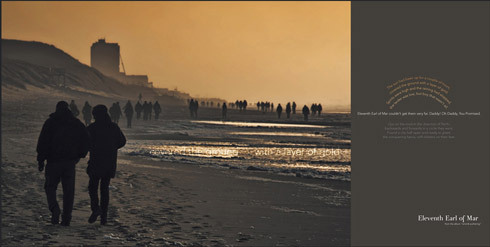 The first line of One For The Vine is accompanied by the photo of a military cemetery – a most ghostlike bride stands in front of the Second Home By The Sea. Photos and lyrics have been combined in good taste; they never go for the cheap surprise effect, but demand that the reader get involved. It is not a difficult task, and it does increase the pleasure of this book. 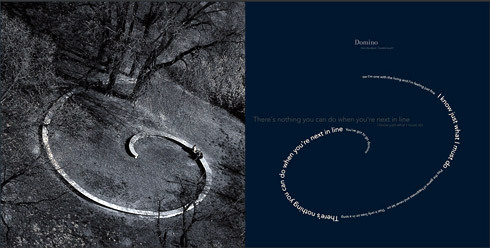 There are three combinations of images and lyrics in this book that cannot draw the reader into their context: The motives used for the Mama lyrics and one of the Entangled quotes have already occurred elsewhere in the world of Genesis, and while the photo that accompanies In That Quiet Earth is an excellent choice one cannot help but think that “this does look exactly like…”. Most of the photos show what the photographer had in front of their lens. Some of them are posed, and there is nothing to be said against that. A few photos were changed by montages, indeed so obvious montages that they disturb the overall effect of the photo. Since all other photos are such an excellent quality, one has to assume that the manipulations were meant to be visible – that the disturbing effect is intended. A good book gently guides the reader to the end. Some coffee-table books do not take the issue seriously and kick out the reader with the simple revelation that there are no more pictures. The book in hand does an excellent job with that. We do not want to reveal too much, so we will only say that Guide Vocal introduces the end. Pay attention to those lyrics and then mark which lyrics accompany the photos on the pages after that. This is very intelligent and very subtle. At the very end the book urges the reader again to “better think awhile”. A brief appendix lists where the lyrics were taken from. It would have been great if the authors had also added where the photos were taken. The image for “Go West young man” becomes all the more potent if you know (as you can, incidentally, find out from the preface) that this is not any old beach. With their book Genesis In Our Flight Of Fancy photographers Maurizio and Angela Vicedomini, Salvo Zannelli and visual designer Daniel Klöckner invite us on a journey through the lyrics of Genesis and show us what they have found there. These are all new points of view and bold associations we are offered here. Even with our own images of the lyrics in our heads one thing is certain: Everything in this book is coherent, consistent, almost palpable. However you choose to read the lyrics, this is a book that combines a large number of extraordinarily well-done and frequently beautiful photos that were inspired by the lyrics of Genesis. 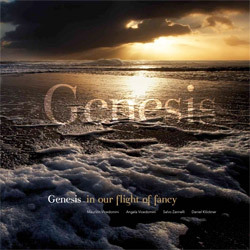 Genesis In Our Flight Of Fancy is a personal, and very pretty homage to Genesis and their lyrics.